The PAL RTC with Robotic Tool Change is the logical (r)evolution of the successful PAL-xt product line. Sample prep for chromatography is no longer the bottleneck – automate your sample prep and sample injection - all on the PAL RTC. Automation is the way to increase productivity and (process) safety in the laboratory. Transferring repetitive or dangerous manual tasks to a robot improves safety. The possibility to run the instrument 24h/day increases throughput, especially for long sample preparations. The PAL RTC was developed to maximize productivity in analytical and clinical labs. 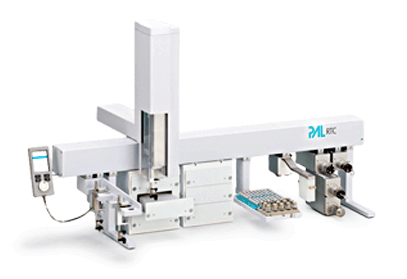 Robotic Tool Change (RTC) brings sample preparation to a higher level. Every process requires a number of different tools for best performance, e.g. a 10µL syringe for the accurate addition of small volumes followed by the dilution with a 1mL syringe. Robotic Tool Change allows to switch between different tools automatically. This additional versatility in combination with the large number of available tools enable the design of tailored automation processes.